Well here is my favorite little guy again Percy. 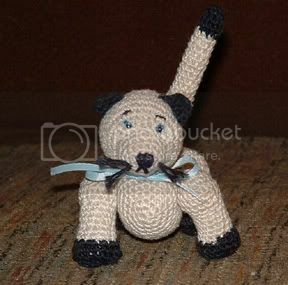 Becky aka Crazzy Cow made him for me with her own hands. Great work Becky! I'm amazed that someone would take so much time for a pal. Becky was my Summer Secret Pal at Crochetville. She didn't send him to me in the reveal, but did send the instructions to make a whole family of kitties. I figured I'd show him off again. 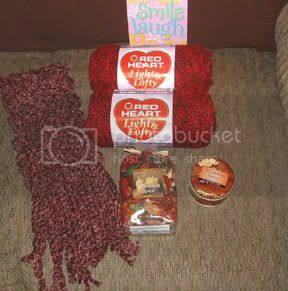 Becky also was extremely generous with her reveal package (shown below) by sending these great things as well. A doiley, two yummy candles that smell so good I'm getting more online. 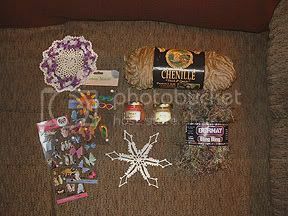 Some Bernat Bling Bling, beautiful chenille from Lion, a snowflake for my tree, and some great stickers, and quilled ones as well. 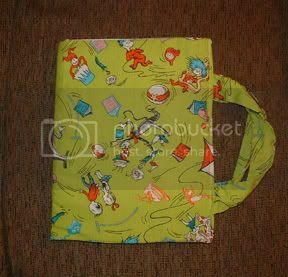 Also she made me the "Cat in the Hat" holder, which I intend on putting some of my downloaded/ printed WIPs in. Thanks so much Becky!!! She has also given me her friendship in return which is a gift within itself!!! Hugs to you Becky!!! 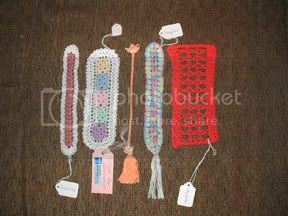 Princesstrish's, Crochetrae's, Diamond's, Crazzycow's, and Ladysource's. Last but certainly not least is my package from my Autumn Secert Pal. My favorite yarn, an extremely gorgeous, and soft scarf (love the edging that you can't see in my photo), a great candle that I have already used up, and some Popourri. Thank you so much. You have really made my days with your emails, and ecards as well. You are a real sweetie!!! I really want to thank my autumn secret pal at Crochetville she has been really sweet with all of the ecards, as well as the goodies that she has sent me. As soon as I get off of here I am going to upload the pictures finally. My summer secret pal was Becky, and we are becoming pretty good online friends as well as her being a really generous pal also. I've been really lucky to meet so many nice people at the ville. Speaking of the ville... it is free to join, and has been written about in articles in magazines such as Interweave knits, and Women's Day Crochet addition recently. It's really exciting to see this once little group turn into such a great place for people to meet, and talk about what they love best. Of course I can't leave without saying that I have been overly depressed about the situation in Louisiana. My heart is breaking for these broken hearted, and very mistreated people. I now feel that I live in a country that I no longer want to live in anymore. I can't keep my eyes off of CNN. For some reason the unspeakable is hard not to watch. That is probably why I haven't been online much lately either. I hope that everyone gives in one way or another. My family will be giving to Habitats for Humanity, and I will be looking for the donation trucks in my area as well. I realize that the cost of getting items there is expensive, but there have been generous people in my area that are paying for the trucks so that we can give items. It just makes you feel a little closer than cash. Even though cash is king right now. Just be careful which charitable organization is getting it.